هل تريد صناعة و عمل الفيديو بكل سهولة ، هل تريد تسجيل الفيديو و رفعه الى مواقع الفيديوهات ، الان برنامج بور دايركتور من أقوى برامج تحرير الفيديو و التعديل على الفيديو حيث يوفر البرنامج كل ما تحتاج إلية فى تحرير الفيديو و عمل الفيديوهات الخاصة بك و أضافة اللوجو و الكتابة على الفيديو بكل سهولة و حفظ الحقوق على الفيديو و تصحيح الألوان المتطورة، و أنشاء فيديوهات عالية الدقة الاتش دى HD ، كما يعطيك البرنامج أمكانية التحكم الكامل فى جودة الفيديو و أختيار صيغة الفيديو و جودة حفظ الفيديو على جهاز الكمبيوتر، و كذالك يمكنك أضافة اللوجو و الشعارات و مقاطع الصوت و الموسيقى على الفيديو بكل سهولة ، كما يمكنك أنشاء فيديو من البوم الصور ، برنامج PowerDirector يوفر لك أمكانية رفع الفيديو مباشرا بعد عملية المونتاج و الانتهاء منة الى مواقع اليوتيوب ، كما ان البرنامج يساعدك على التحكم الكامل فى الفيديو و تدويرة باى زاوية و قص و أضافة أجزاء من الفيديو و دمج أكثر من مقطع فيديو فى فيديو واحد . 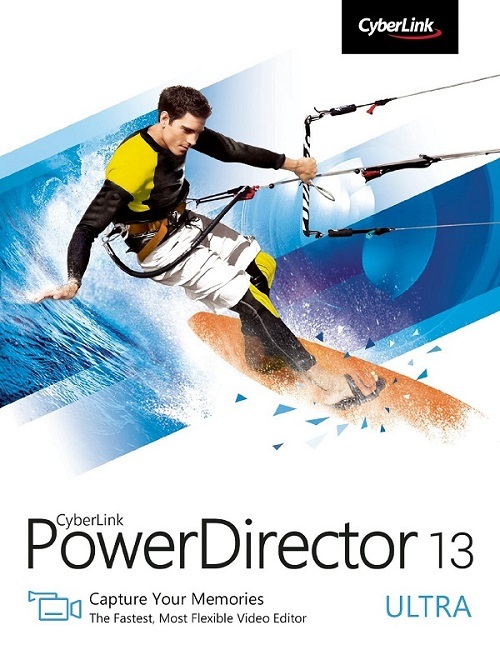 PowerDirector 13 Ultimate includes all the powerful video editing tools for high quality video productions - 100-track timeline, MultiCam Editing, the world's fastest 64-bit TrueVelocity engine and much more. It comes with worth over $650 value premium effects and templates to enrich your video creation, 10GB cloud services for the first year and PowerDirector Mobile for video editing on smart devices. Cloud Tools, Fully Customizable Design Tools, Over 60 New Features, Effects and Templates and Much More Unleash your creativity with PowerDirector 13's customizable design tools - create your personalized transition, titles and disc menu, and edit up to 100 multicam clips with the most powerful video editing software! Need more effects and templates? 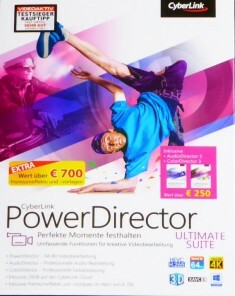 PowerDirector includes over 50 new effects and templates to polish your video creations. When your creation is done, you can backup your projects using CyberLink Cloud service, or create movie discs with our new Menu Designer! 100 Track MultiCam Editing The new MultiCam Audio Sync feature allows you to synchronize up to 100 timeline tracks by audio. Which means you can easily create MultiCam collages by freely transform video tracks as a PiP (picture in picture) object. Customized Transition Effects The new Transition Designer provides an easy way to customize transition effects from an image. Simple import a image, PowerDirector will create the transition effect basing on the image you choose. Enhanced Menu Designer PowerDirector 13's menu designer greatly enhanced the usability - automatically align disc menu items when designing customized disc menu, you can also choose to display video thumbnails, or use a cleaner text menu without thumbnails. Enhanced Video Stabilizer The enhanced stabilization engine smartly detects multi-axis and rotational shakiness, and remove the shakiness in sports videos. CyberLink Cloud Service CyberLink Cloud is designed to work perfectly with PowerDirector to safely store your media creations and other files via the latest in cloud technology. Enhanced Media Library PowerDirector's easy-to-use media library interface smartly put your source media, effects and tools in place. You can freely adjust the workspace to optimize productivity or search media library with keywords. H.265/HEVC Designed to utilize substantially less bandwidth. H.265 provides same compression quality with 32% size of H.264 videos. XAVC-S XAVC-S is the new standard of 4K and HD videos, widely used in latest Sony camera and camcorders. Over 50 New Effects & Templates PowerDirector 13 comes with over 500 effects and templates, including over 50 brand new animated PiP objects, animated themes, titles and much more! Create On-the-Go Edit video anywhere with PowerDirector Mobile your Android and Windows 8 tablets with intuitive timeline interface. Drag-and-drop videos and photos, overlay transition and title effects, just like editing on your PC! Export ISO Image File When producing DVD or Blu-ray Discs, you choose to save the disc creation to ISO image format, which is easier to archive and retrieve your disc creations.